In the GECCO 2007 keynote discussion on evolution and complexity, the issue of the definition of complexity comes up. Richard Dawkins refers to the definition of complexity in terms of information theory and minimum description length (MDL), even if he doesn't use those terms. The thing to note is that even though the millipede might have more body segments, those segments are relatively uniform, so it would take less information to describe them. However, even though the lobster might have fewer segments, there is much more specialization and differentiation among them. 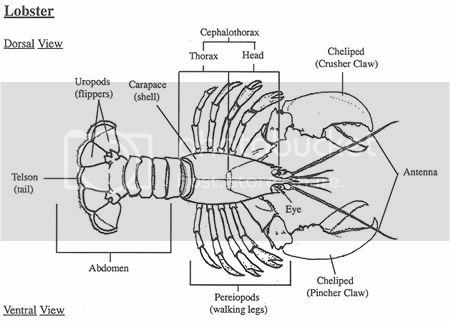 So if one were writing a book on the gross morphology of these two creatures, the description of the lobster would require more information, and thus you could conclude that lobsters, generally speaking, are more complex than millipedes. This analysis ignores the relative complexity of the two organisms based on other levels of analysis, for example, the cellular level, so we really can't conclude that lobsters require more information to specify completely than millipedes, but it's still a nice example. So what about the human brain? The older parts of the human brain are much more specialized and differentiated, but our neocortex, is thought by many researchers to be relatively uniform (hence one of its other names, "isocortex"). The neocortex has primarily overtaken and expanded many of the functions previously carried out by older parts of the brain (such as vision), and has allowed for the emergence of new functions (like language), and it now constitutes about 75-80% of the volume of a human brain. But if we can reach some consensus that the neocortex is anatomically uniform, with repeating modular structures that are relatively undifferentiated, and that those modules carry out essentially the same algorithms, with only slight modification of certain parameters, then the newest and biggest part of our brains is really not all that complex, in terms of MDL. Those are some big "ifs", but from my limited experience and knowledge, I believe it is the case, and it provides a measure of hope for understanding what seems like a hopelessly complex forest of connections (the "Astrodome filled with spaghetti" analogy). However, if it is true that the human neocortex is less complex relative to older brain areas, we have something that seems like a contradiction, if we look at the complexity of the behavior of the organisms. Language itself is a very complex behavior, again in terms of MDL, relative to behaviors of other organisms. So how could it be that simpler, more uniform structure could give rise to more complex behavior? The answer to that question might lie in an analysis of complex systems, like the toy example of Conway's Game of Life, a very simple algorithm that generates very complex patterns. There are many other examples that demonstrate that relatively simple rule-based systems can generate enormous complexity, so the riddle of the decreased complexity of the neocortex and the increased complexity of mammalian behavior isn't so impenetrable. Then again, this could all be wrong. All that seeming uniformity could be illusory, and the neocortex could be far more specialized and differentiated at the local level than we currently understand. I'm personally betting the other way, and eventually time will tell.